Tameeka Time: Stop eating that .... Crackhead! Stop eating that .... Crackhead! For the past few years ... the term crackhead has been used by almost everyone. a habitual user of cocaine in the form of crack. We even hear about crackheads from almost every black stand up comic. I also have to admit that I've called a person or two a crackhead due to their jittery ways. 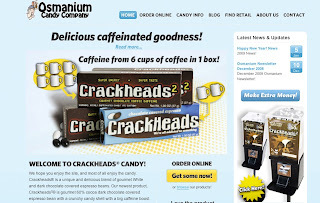 And I guess the term crackhead is more popular than I expected because the Osmanium Candy Company decided to name one of their products: "Crackheads"
Crackheads is described as "delicious caffeinated goodness"
Crackheads® is a unique and delicious blend of gourmet White and dark chocolate covered espresso beans. Our newest product, Crackheads2® is gourmet 60% cocoa dark chocolate covered espresso bean with a crunchy candy shell with a big caffeine boost added! Gourmet meets functional. Each box of Crackheads2® contains the same caffeine in approximately 6 cups of coffee, 7.5 Red Bull® energy drinks, or 11 cans of Mountain Dew®!. I know tons of people who can not live without coffee - but damn who really needs to eat a box of candy that equals 11 cans of Mountain Dew....barf!